I asked my husband to creat me an image from his website TheSeedProject.net for my, “C is for Choice,” blog, and this is the image he emailed me. 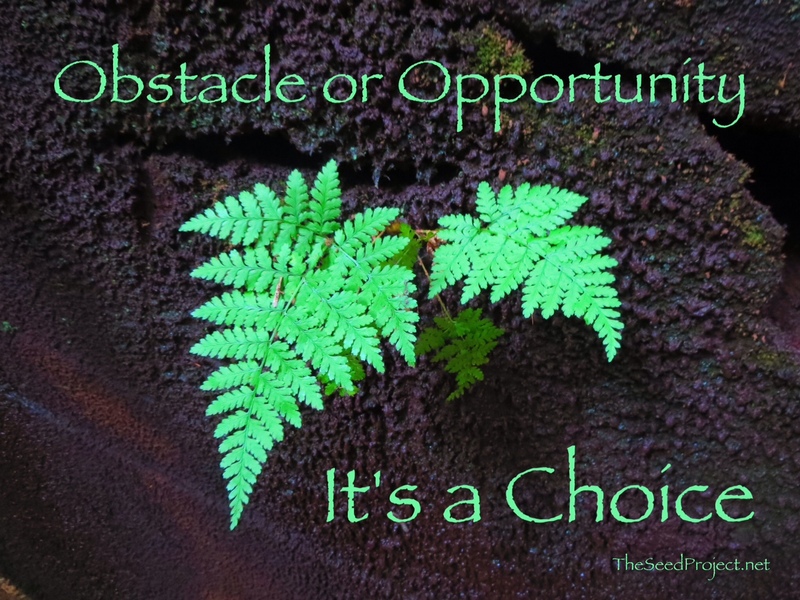 At first, I thought, “Wow I love the words, but a few leaves don’t look like much of an obstacle.” I asked him why didn’t he choose something more, “Obstacle or Opportunity,”ish like a trail or a mountain. That’s when I discovered that I was only seeing the leaves, and not where they were coming from. This was a photo from our trip to the California Redwood Forest last summer. A Giant Redwood had fallen on it’s side, cut at a straight horizontal angle, and it’s face had been completely charred during a fire. From this fallen, chopped, and charred tree spring life in the form of these little fern leaves. As a parent, I often feel like my choice is worth more now than ever. Every single decision I choose not only effects me, it also effects my children. Whether we realize it or not, those choices big or small might possibly be the defining moments that shape your child or stick with them into adulthood. It has been almost exactly a year since Marley was diagnosed with Optic Nerve Atrophy. I wrote all about it in my, “Marley and Me Musical Chairs,” post. Once upon a time not to long ago, I felt angry, guilt, grief, and fear. I was so incredibly afraid of the challenges my daughter would face in life. I was afraid that, like her mommy, she would be bullied by the mean kids in school, afraid that she would be ashamed of who she was, afraid that she would fall through the cracks in the educational system, and worst of all I was afraid that she would blame me for her blindness. What does being afraid get you? Nothing. Fear only brings more fear. I chose to shift my fear into a fierce passion for a future full of endless opportunities. Last November, I and a few other parents, organized the Nevada Organization of Parents of Blind Children. My vision for this organization is to reach every single parent of a blind or visually impaired child in Nevada. As human beings we thrive when we connect with other human beings. Blindness can be a scary thing. Blindness can be a life changer. However, blindness can also be empowering and powerful. If we as parents choose to fear blindness, than our children will too fear blindness. Instead of fearing blindness, I choose to embrace it. When I hold my long white cane, I feel confident. I feel as if nothing can stop me if I have my can with me. Marley has even begun to acknowledge her feelings. The other night while cuddling in bed after we’d read a few pages from her Braille copy of , “Amelia Bedelia,” she whispered that she felt nervous about using her cane, especially if I wasn’t there with her using mine. This was after a long four day weekend where both my husband and I had been busy in classes and my mother in law was flown in to stay with the kids. She didn’t want to look different or want to have people look at her. I told her it was ok to feel nervous, but we needed to figure out a way to turn that nervous feeling into a powerful feeling. We talked about all of the fun times we’ve had while using her cane like on our hikes, our camping trips, and decorating it and taking it trick-or-treating on Halloween. We also talked about the times she tripped and fell because she didn’t have her cane with her. So instead of feeling nervous about anymore, she chooses to feel happy, safe, and powerful when she has it. Until I write again, let’s all choose to make it a powerful week! Posted on January 25, 2015 by MamaRupp	• This entry was posted in Uncategorized and tagged Blind, blindness, Child, choice, choose, empower, feeling, obstacle, opportunity, Parenting, powerful, shift. Bookmark the permalink. Wise words. We all have tough choices and fear sure brings on more fear.